In recent years there has been an increasing interest in an ephemeral and viral form of art that is marking urban settings around the world, and has developed a flourishing sub-culture all its own. Now though, street art is going mainstream. Auctioneers, collectors and museum directors are scrabbling to learn urban art vocabulary and develop positions on the big street art issues. In this primer post Art Radar gives you a heads up on what you need to know. 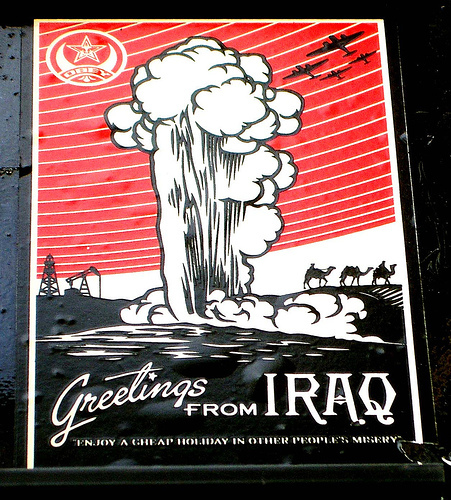 Considered by some a nuisance, for others street art is a tool for communicating views of dissent, asking difficult questions and expressing political concerns. Its definition and uses are changing: originally a tool to mark territorial boundaries of urban youth today it is even seen in some cases as a means of urban beautification and regeneration. Whether it is regarded as vandalism or public art, street art has caught the interest of the art world and its lovers of beauty. 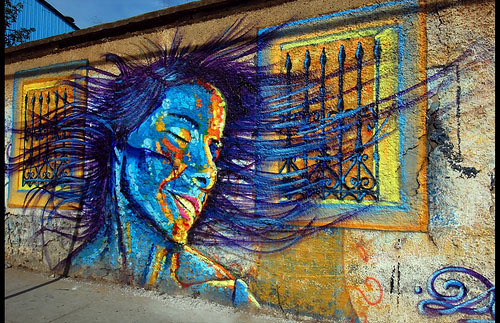 With permission, traditional painted graffiti is technically considered public art. Without permission, painters of public and private property are committing vandalism and are, by definition, criminals. 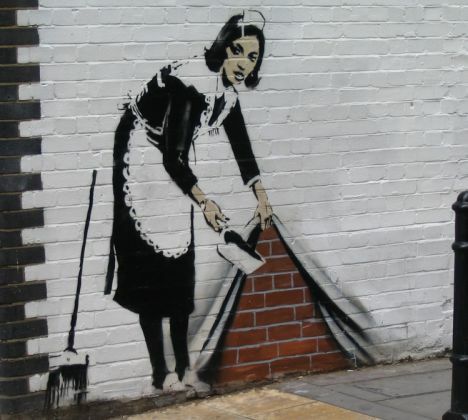 However, it still stands that most street art is unsanctioned, and many artists who have painted without permission, (Banksy, Shepard Fairey) have been glorified as legitimate and socially conscious artists. Although it is extremely difficult, if not impossible, to clearly define what unsanctioned imagery is art and what is not, the effects of such images can be observed and conclusions can be reached regarding images’ function within a public environment. Vandalism is inexcusable destruction of property, and has been shown to have negative repercussions on its setting. It has also been observed by criminologists to have a ‘snowball effect’ of generating more negativity within its vicinity. Dr. James Q. Wilson and Dr. George Kelling studied the effects of disorder (in this case, a broken window) in an urban setting, and found that one instance of neglect increases the likelihood of more broken windows and graffiti will appear. Then, there is an observable increase in actual violent crime. The researchers concluded there is a direct link between vandalism, street violence, and the general decline of a society. Their theory, named the Broken Window Theory and first published in 1982, argues that crime is the inevitable result of disorder, and that if neglect is present in a place, whether it is disrepair or thoughtless graffiti, people walking by will think no one cares about that place, and the unfavorable damage is therefore acceptable. Traditional- Painting on the surfaces of public or private property that is visible to the public, commonly with a can of spray paint or roll-on paint. It may be comprised of just simple words (commonly the writer’s name) or be more artful and elaborate, covering a surface with a mural image. Stencil– Painting with the use of a homemade stencil, usually a paper or cardboard cutout, to create an image that can be easily reproduced. The desired design is cut out of a selected medium, and the image is transferred to a surface through the use of spray paint or roll-on paint. Sticker– (aka sticker bombing, slap tagging, and sticker tagging) Propagates an image or message in public spaces using homemade stickers. These stickers commonly promote a political agenda, comment on a policy or issue, or comprise an avantgarde art campaign. Sticker art is considered a subcategory of postmodern art. 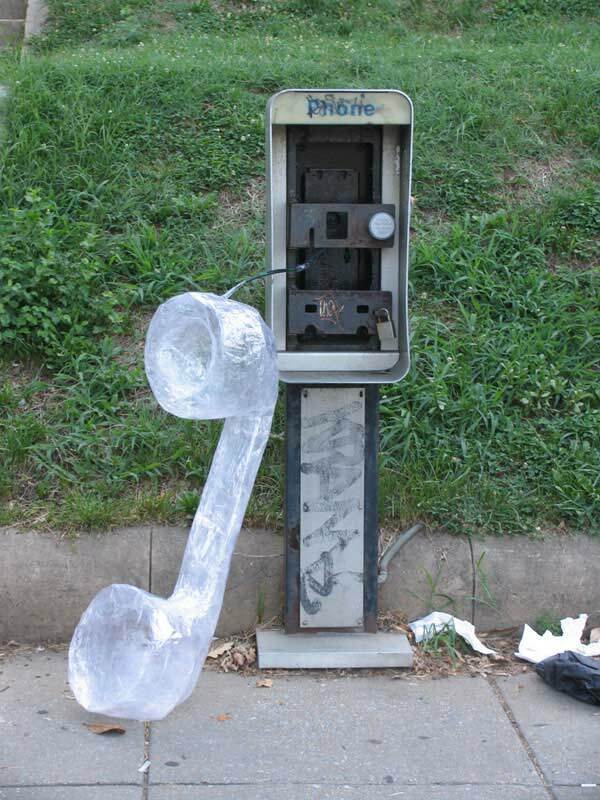 Street installation- Street installations are a growing trend within the ‘street art’ movement. 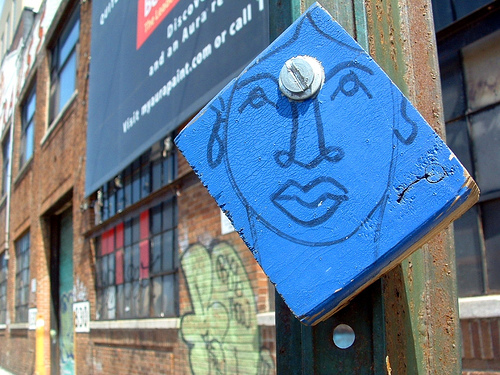 Whereas conventional street art and graffiti is done on surfaces or walls, ‘street installations’ use 3-D objects and space to interfere with the urban environment. Like graffiti, it is non-permission based and once the object or sculpture is installed it is left there by the artist. Wood blocking- Artwork painted on a small portion of plywood or similar inexpensive material and attached to street signs with bolts. Often the bolts are bent at the back to prevent removal. It has become a form of graffiti used to cover a sign, poster, or any piece of advertisement that stands or hangs. Flash mobbing- A large group of people who assemble suddenly in a public place, perform an unusual action for a brief time, then quickly disperse. 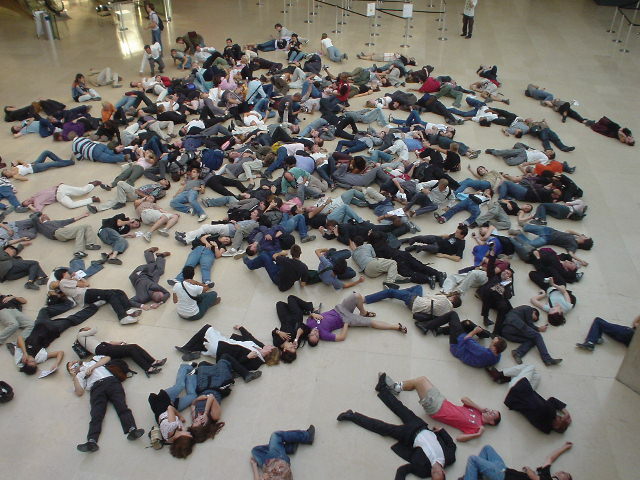 The term flash mob is generally applied only to gatherings organized via telecommunications, social networking, and viral emails. The term is generally not applied to events organized by public relations firms or as publicity stunts. This can also be considered mass public performance art. Yarn bombing- Yarn Bombing is a type of street art that employs colorful displays of knitted or crocheted cloth rather than paint or chalk. The practice is believed to have originated in the U.S. with Texas knitters trying to find a creative way to use their leftover and unfinished knitting projects, but has since spread worldwide. 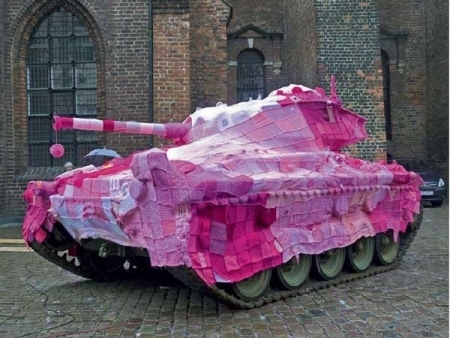 While other forms of graffiti may be expressive, decorative, territorial, socio-political commentary, advertising or vandalism, yarn bombing is almost exclusively about beautification and creativity.